Staff from the Cheshire West and Chester Council’s StreetCare and Greenspaces teams have been working hard to ensure the borough remains beautiful and a haven for wildlife, while they carry out essential day-to-day maintenance. The teams are carrying out grass cutting operations and also looking for suitable locations for wildflower verges. Some residents recently raised concerns on social media after grass cutting operations cut down potential habitat for bees in some areas. The Council’s Cabinet Member for Environment, Councillor Karen Shore said: “Although our grass cutting operations have started across in the borough, we know the vital role bees and other wildlife have in pollination. However, we have to strike a balance between maintaining our beautiful borough, driver safety and nurturing wildlife. 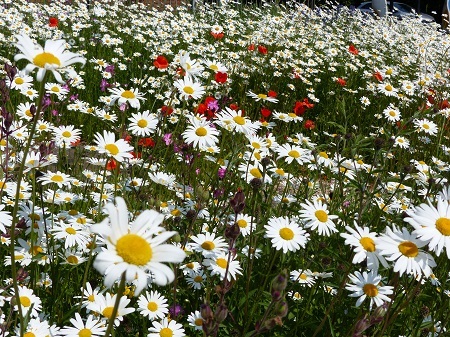 “To boost biodiversity in the borough our StreetCare teams have planted dedicated wildflower areas which are a mix of cornfield and meadow styles. Extensive new meadow areas will also be created in some of our parks. Man-made meadows promote a very high diversity of wild plant species and stops grasses from taking over. The variety of flowers in turn attracts lots of insects and, of course, the creatures that feed on them. “We are keen to get the balance right and are looking at a long-term strategy that will link with the recent launch of the ‘The good verge guide’ by Plantlife, the national conservation charity, and our intention to increase in wildflowers across the borough. “Many of our existing verges and hedges contain mixed species, often with fruit trees, to help pollinating insects like bees. A cycle of cutting on grass verges ensures their regeneration and is the best method to ensure any flowering plants aren’t blocked by hardier grass plants.